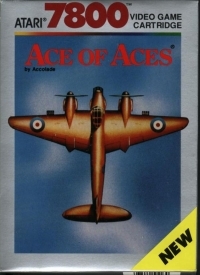 Box Text: Ace of aces puts you in the cockpit of the mosquito, the maveric RAF fighter bomber of World War II. It's white knuckle aerial combat simulation, combining the exhilaration of flight with the gut-wrenching pressure of enemy confrontation. During World War II, mosquitos downed 659 enemy aircraft and 500 V-1 buzz bombs. Your only allies are your wits, your weapons and your radar. Are you equal to the challenge? Down the nazi bombers, sink the U-boats, outrun the V-1 buzz bombs, and stop the enemy trains to release the POWs. Should you fly through the storm or around? Navigate carefully, consult your intelligence reports and maps to make a decision. Choose your weapons and fuel wisely - once your on a mission, there is no going back. Select one mission or any combination. 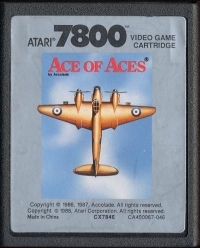 If you complete all four successfully - and make it back alive - you'll become the most distinguished veteran of World War II - the Ace of Aces! 10-03-2015 alamoatari Box Text Ace of aces puts you in the cockpit of the mosquito, the maveric RAF fighter bomber of World War II. 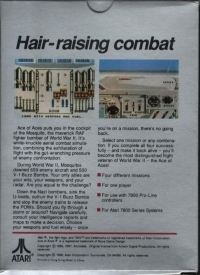 It's white knuckle aerial combat simulation, combining the exhilaration of flight with the gut-wrenching pressure of enemy confrontation. During World War II, mosquitos downed 659 enemy aircraft and 500 V-1 buzz bombs. Your only allies are your wits, your weapons and your radar. Are you equal to the challenge? Down the nazi bombers, sink the U-boats, outrun the V-1 buzz bombs, and stop the enemy trains to release the POWs. Should you fly through the storm or around? Navigate carefully, consult your intelligence reports and maps to make a decision. Choose your weapons and fuel wisely - once your on a mission, there is no going back. Select one mission or any combination. If you complete all four successfully - and make it back alive - you'll become the most distinguished veteran of World War II - the Ace of Aces! This is a list of VGCollect users who have Ace Of Aces in their Collection. This is a list of VGCollect users who have Ace Of Aces in their Sell List. This is a list of VGCollect users who have Ace Of Aces in their Wish List.